Tannoy Revolution XT8F review | What Hi-Fi? Tannoy’s new Revolution XT range has made quite an impact. The XT6F floorstanders (£1000) waltzed away with a Group Test win in our May issue, while the XT6 standmounters delivered a strong showing the month before. Having spent a considerable amount of time with the new Tannoy Revolution XT8Fs, we think they’re arguably the best of the bunch. 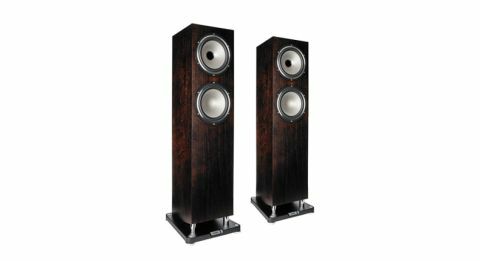 In essence, these are just larger 6Fs, using an 8in (20cm) version of Tannoy’s dual concentric driver rather than the 6in version. Tannoy has put a lot of work into this latest generation of drive unit, honing just about every aspect of the design from the motor system to the tweeter waveguide in an attempt to push performance standards higher. By putting the tweeter in the middle of the mid/bass driver, integration is improved over the separated arrangement used in most rivals, as is the time alignment of the drive units and uniformity of dispersion. In the XT8F, a dedicated 20cm bass driver augments the dual concentric’s output. The additional unit comes into play below 250Hz. We think Tannoy has done a great job with the cabinet. It’s solid and smartly finished, though with a volume of almost 50 litres, it’s pretty big. There are two finish options: Medium Oak and Espresso (a dark walnut), but we think both look smart. There’s more to this 108cm tall cabinet than just crisp edges and angled sides, which are designed to reduce the build up of internal standing wave. Tannoy has designed a coupled cavity bass reflex system to optimise low-frequency performance. A downward-firing port exits into the gap between the base of the cabinet and plinth. As we start listening, it’s obvious the work has paid off. We begin with Hans Zimmer’s Time (from Inception OST) and discover that these Tannoys are capable of producing oodles of low-frequency information. Not only is it deep, it’s delivered with real power and precision. There’s plenty of agility here coupled with a solid punch. If you have a medium sized room, say anything smaller than 4x4m, then it’s possible that the quantity of low-end may prove too much. But give them a larger room to play in and the XT8Fs will shine. In a suitably large space these speakers deliver a scale of sound, loudness capability and dynamic reach that’s hard to better for the money. There’s more to these towers than just bass and brawn, though. Move up the frequency range and they’re articulate and communicative; alt-J’s Breezeblocks is delivered with enthusiasm and coherence. There’s a fine degree of rhythmic drive and plenty of attack on offer. Vocals are crisply rendered, lacking nothing when it comes to subtlety and precision. There’s a lovely directness to the way these speakers produce sound that just draws the listener into the music. Tonally, these Tannoys aren’t the sweetest sounding performers around. You’ll have to take care not to partner them with anything that sounds overly forward or harsh, because they’ll do little to tone these qualities down. But feed them with well-balanced electronics and these floorstanders will deliver. We’re pleased with the stereo imaging. These speakers shine when placed well out into our test room and given just a touch of toe-in towards the listening position. Once the Tannoys are positioned with care their sound stage is crisp, nicely layered and pleasingly solid. Given a suitably talented system and a large enough room, few rivals can match the XT8F’s combination of muscle and subtlety. Most of all they make listening to music fun and that, more than anything else, is the reason why we’re happy to recommend them wholeheartedly.